I Don’t Want To Lose My Hearing! What Can I Do? Electronic? Nonlinear? What The Heck Are You Talking About? Help Me Pick Out The Best Hearing Protective Devices! What Is The Best Nonlinear In-The-Ear HPD? What’s The Best Electronic In-The-Ear Hearing Protection Device? What Are The Best Unpowered Earmuffs? What’s The Best Set Of Electronic Earmuffs? What Should I Look For In A Hearing Protection Device? Let’s face it, shooting is an extremely enjoyable hobby, but it has its pitfalls. You have to take appropriate safety precautions, and one of the most overlooked of those precautions is protecting your hearing. Firearms are loud – the typical .22-caliber rifle can produce noise levels approaching or exceeding 140 decibels (dB). Larger caliber rifles and handguns will often generate noise exceeding 175 dB. You compound that problem even more when you’re shooting indoors, where the sounds can reverberate and get louder. According to Michael Stewart, Ph.D., CCC-A, Professor of Audiology at Central Michigan University, exposure to noise greater than 140 dB can permanently damage your hearing. In fact, Dr. Stewart says that people who go without hearing protection can suffer a severe hearing loss even with just a single shot, if the conditions are right. The averages point to people using firearms losing their hearing more frequently than those who do not. Stewart points out that firearm users tend to suffer from high-frequency permanent hearing loss, which affects their ability to hear speech sounds like “s,” “th,” “v,” and other high-pitched sounds. This is often more prevalent in the left ear (for right-handed shooters) more often than the right, because the left ear tends to be closer to and directly in line with the muzzle of the firearm. The good news is that you don’t have to lose your hearing to enjoy your firearm use. 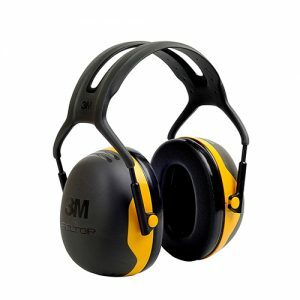 There are hearing protective devices (HPDs) like earmuffs and earplugs that will protect your delicate ears from damage. These fall into two broad categories: electronic HPDs and nonlinear HPDs. An electronic HPD will make softer sounds louder, but shut everything down as soon as there’s a loud noise. That’s when the device becomes hearing protection. These include earmuffs, in-the-ear devices, earplugs, and behind-the-ear models. Nonlinear HPDs aren’t electronic, but are still designed to allow soft and moderate sounds to pass through while still reducing louder, damaging noises. 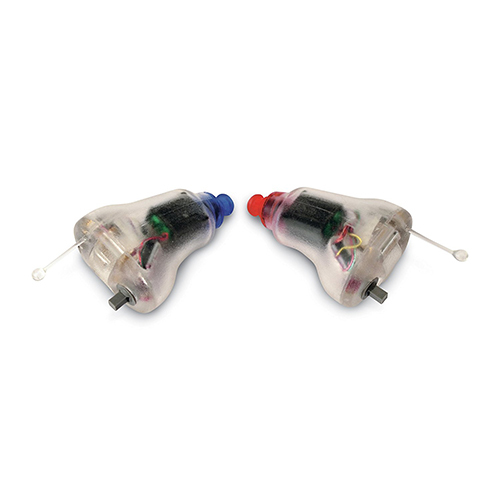 These can be earplugs inserted into the ear canal, or custom-made earmolds. A nonlinear HPD with filters is the best choice; other models use mechanical valves that may not close fast enough to protect your ears from loud noises. Okay, let’s talk about some awesome HPDs, and help you pick out the best variant for your particular needs. Later, I’ll give you a buyer’s guide that outlines what you should be looking at when you make your final selection. There are lots of choices, so I’ll go one category at a time and let you decide which is best for you. There are plenty of options to choose from, and you can spend as much money as you want on hearing protective devices. You don’t absolutely have to spend an arm and a leg for hearing protection, though. Let’s examine some great choices for nonlinear in-the-ear HPDs. In fact, SureFire makes a nonlinear model that works almost perfectly, and yet costs less than a box of ammo. The SureFire EP4 Sonic Defenders Plus is one of my favorite nonlinear HPDs, for a number of reasons. It features a low-profile, triple-flanged stem to securely seal itself in your ear canal and remain comfortable all day long. The plugs secure themselves not just inside your ear canal, but all around your ear to lock into place. In fact, this HPD features patented EarLock retention rings that utilize seven contact points to hold the device in place and prevent loss. With the included filter caps inserted, the Sonic Defenders work to cancel out any noise louder than 85 dB. The proprietary design actually cancels out more noise the louder the sound, so you can use these confidently, without any worries of your .50-caliber Desert Eagle causing you to go deaf. At the same time, safe ambient sounds like conversations are still perfectly legible. If you want to block out everything, including ambient sounds, snap on the filter caps and you’ll tune all noises out completely. 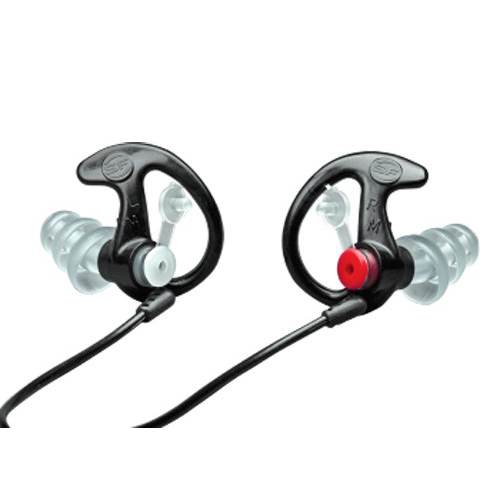 You can also remove the filters completely to use the earpieces with compatible radio communication systems (or your MP3 player), but you lose all hearing protection when you do that. Maybe you don’t want something complicated and feature-rich, just a set of ear plugs you can pop in and block out the dangerous noise levels of gunfire. If that’s the case, the Tourbon Soft Silicone Corded Ear Plug Reusable Hearing Protection might be right for you. These ear plugs are corded, so you won’t lose them, and fit comfortably inside your ear canal with a triple-flanged design. The cord is detachable, if you don’t want it dangling around your neck, and the plugs filter out all noises with a noise reduction rating of 18 decibels. There’s a distinct advantage to electronic hearing protection devices: they often include an amplifier for ambient and soft noises, while at the same time blocking out those dangerous impulse sounds like gunfire and explosions. These tend to be more expensive, but that added investment can be worth it. Let’s look at a couple of options. If you want electronic in-the-ear HPDs, one of the best products available is Walker’s Game Ear Micro Elite Listening Devices. These fit comfortably in your ear canal, and have four listening modes: general, crowds, music/theater, and nature. Choose whichever one provides you the best soft noise amplification for your needs. Regardless of which choice you make, you’ll have 22-decibel noise reduction rating for impulse sounds like gunfire, when you wear the devices with the included foam plugs. When it comes to in-the-ear hearing protection, you don’t get much better than Walker’s Game Ear. 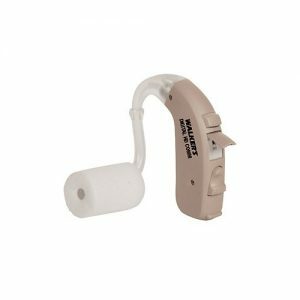 When money’s no object, Etymotic Research makes a truly outstanding piece of kit: the ER125-EB15LEBN BlastPlug Electronic Hearing Protection. 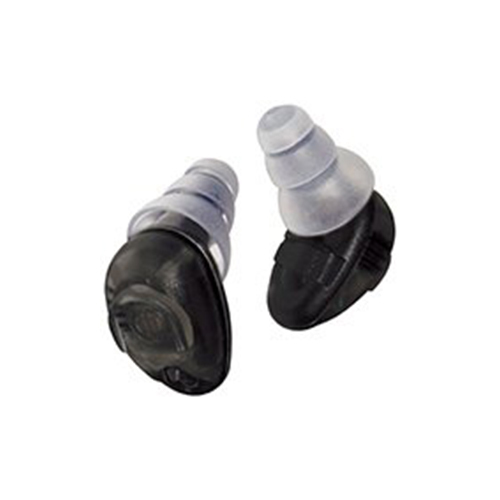 These in-the-ear plugs are battery-powered, and incorporate a design that provides 360-degree situational awareness. The earplugs amplify soft sounds, providing unrivaled speech intelligibility in loud noises while still protecting your delicate inner ear from the damage loud impulse sounds like explosions and gunfire can cause. The triple-flanged soft silicone ear inserts fit perfectly into your ear canal, and the combination of amplifer and noise-cancelling technology is truly top notch. The only real downside here is that the design doesn’t fit around the outer part of your ear, so you’ll be continuously worried about them falling out. The earplugs never fell out for me, but the comfort and confidence levels weren’t terribly high. Next up, we’ve got behind-the-ear (BTE) hearing protection devices. These look, and often act, like hearing aids, but with a twist: they also include noise suppression to protect your fragile ears from loud noises. These often offer more capabilities than in-the-ear models, but the miniaturization of technology is rapidly changing that. For now, though, BTE models offer an unparalleled combination of comfort and functionality. Let’s see what a couple of options can do for us. 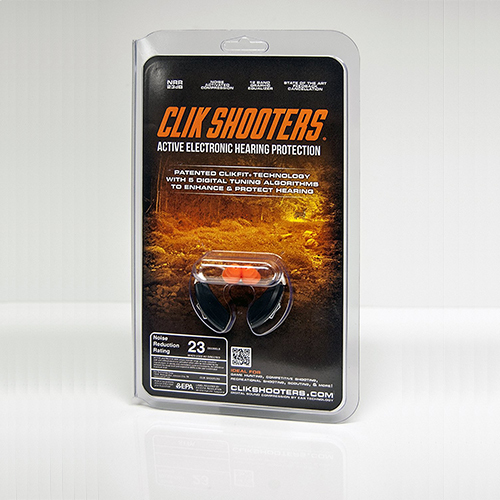 When it comes to protecting your hearing, few companies do it better than Clik Shooters with their Active Electronic Hearing Protection. This variant offers a noise reduction rating of 28 dB, reducing even the loudest sounds to a safe level. In addition, you get five amplification settings to choose from, so you can have the softer ambient noises boosted almost as loud as you could want. Sound-activated compression and feedback control round out the features of this model. Next up, we have another Walker’s Game Ear product: the Digital HD Comm Hearing Enhancer. This BTE model offers high-definition sound reproduction for distortion free sound, while still providing you with hearing protection against loud impulse noises. It integrates with FRS or GMRS two-way radios with external microphone ports, adding some additional functionality. It’s also lightweight, at less than a quarter of an ounce. The downside? Short battery life and less-than-stellar customer service. 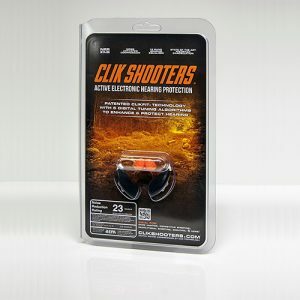 If you don’t like shoving things in your ears, you might prefer a good set of shooter’s earmuffs. These are large and bulky, but some people prefer them. These come in two varieties, powered and unpowered, but let’s look at the simpler ones first. All these will do is filter out the sound, so they’re as barebones as you’ll get. The beauty of this model is in its design: it offers unparalleled protection against loud noises, with a Noise Reduction Rating of 24 decibels, but it maintains a level of comfort that’s almost unheard of in earmuffs. The twin headband helps release heat while still maintaining a solid fit against your head, holding the muffs securely against your ears. 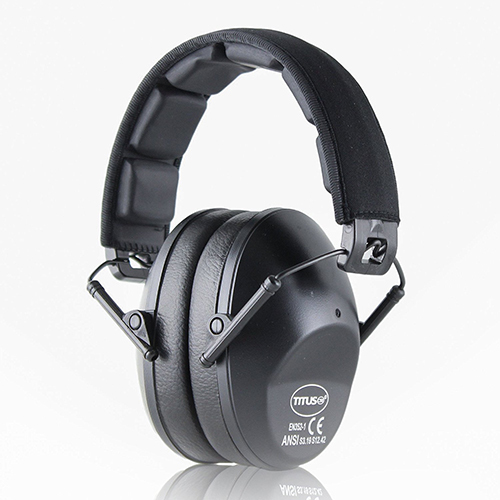 If you want something a bit slimmer, consider the Titus Premium Hearing Protection Ear Muff. This model is a newly updated design with a premium headband with padding for extra comfort. The ear cushions are also padded, providing a snug, comfortable fit. 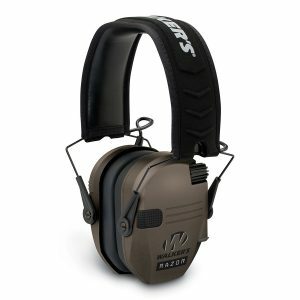 This earmuff provides a Noise Reduction Rating of 34 decibels, giving you an amazing amount of hearing protection. Unfortunately, they’re built around a “one size fits all” design that doesn’t work well for those with large heads. So, you want the earmuff design with the features of an electronic HPD. Easy enough, fortunately for you, since there are lots of options out there. What this will give you in most cases is the amplification of ambient sounds and game calls, along with conversations, while still blocking out those dangerous impulse sounds like gunshots. 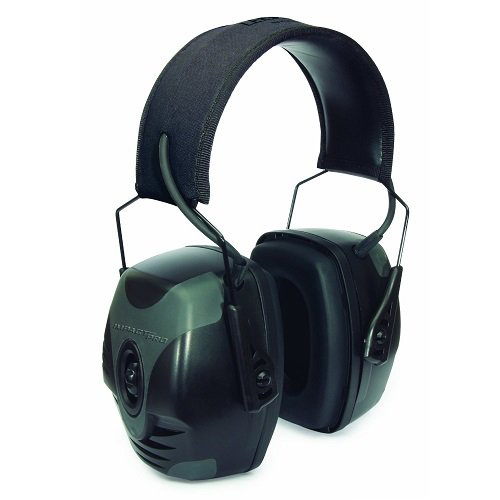 Honeywell produces a terrific option for electronic earmuff HPDs, the Howard Leight Impact Pro model. This earmuff offers two levels of hearing protection: it actively listens and shuts off amplification when the ambient sound reaches 82 decibels, but it also passively blocks out noise at 30 decibels. The earmuffs incorporate rubberized pressure points to prevent scratching, and the padded adjustable headband gives you a secure, comfortable, and tight fit. The built-in directional microphones amplify range commands and other ambient sounds to a safe 82 dB, giving you enhanced communications and more natural listening, while loud impulse sounds like gunshots are automatically cancelled out. An external audio jack allows you to connect your earmuffs to your MP3 player, scanner, or any other audio source. An automatic shutoff function preserves battery life by turning the device off after four hours. The drawbacks to this variant come down to this: the comfort level isn’t really there for all-day use, and the volume has to be turned up to maximum to attain a “normal” level of hearing. External audio jack for MP3 player, scanner, etc. When you’re hunting, you want to be able to hear certain sounds while blocking out the dangerous noises. Walker’s Game Ear Razor Slim Electronic Muff offers you two omnidirectional microphones to pick up those deer grunts and duck calls, while cancelling out anything over 89 decibels. This means you can still hear when your hunting buddy is whispering to you, louder than you’d hear it with your naked ears, but you won’t be deafened when your shotgun blasts. You also get an audio input jack, so you can even listen to your tunes while you’re out in the bush! The downside of this model is that it only offers a Noise Reduction Rating of 23 dB, and the warranty is only 90 days. Okay, let’s say you’ve decided you don’t like any of the options I’ve given you for HPDs. Too bad! No, just kidding. Here are some things you should look for when you are searching for that perfect HPD. These are the factors I’ve considered in recommending the products I’ve listed above, and are the best things to think about when you’re shopping for yourself. This is how much hearing protection you’ll actually get out of the HPD. The Noise Reduction Rating, or NRR, is a unit of measurement used to determine the effectiveness of your HPD in decreasing sound exposure. The higher the NRR, the better the hearing protection, but it’s a bit more complicated than you might think. You might assume that if you were exposed to a 12-gauge shotgun blast, which is around 140 decibels, and you were wearing earmuffs with an NRR of 24, your actual level of noise exposure would only be 116 decibels. Unfortunately, that’s not the case. To determine how much decibel deduction to apply, you need to actually take the NRR figure, subtract seven, and then divide by two. Confusing, isn’t it? Just memorize that fact, and know that in the previous example, you’d actually deduct 8.5 decibels. It looks like this: (24–7)/2 = 8.5. That means your level of noise exposure would still be dangerously high: 131.5 dB. Wearing dual hearing protectors (for example, earplugs and earmuffs) won’t double up, either. Instead, it would add five more decibels of protection to the device with the higher NRR. Okay, once you figure out how much NRR you need, it’s time to think about comfort. You’re going to be wearing your HPD for an extended period of time, and you don’t want to get so sore you’re tempted to take off what’s standing between the loud bang and your sensitive ear. This is why in-ear and behind-the-ear protection is so much more popular than earmuffs, because it’s difficult to get enough hearing protection from something that has to fit over your ears while still keeping it comfortable. Finally, think about how long your HPD is going to last. It might be tempting to just buy the cheapest model you can find, but if that HPD won’t last more than a few months, you’ll just be replacing it. For my money, the best option is an in-ear option with replaceable ear tip inserts. These inserts are inexpensive, and I still get the longevity of the main part of the HPD. Well, there’s a complete treatment of a subject that is usually overlooked: hearing protection. I hope you’ve learned a bit, and I pray you’ve found some good options here for preserving your hearing while still enjoying yourself at the shooting range or in the hunting field.